U.S. Soccer coaching curriculum for youth soccer. This site is one of the most helpful sites you will find. It helps you coach the "swarm" (when all kids rush the ball) and provides very useful drills for all ages. Click here for an illustration of the offside rule. This site is helpful if you need help determining positions of players. 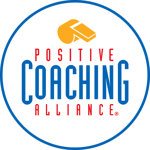 Positive Coaching Alliance (PCA) is transforming youth sports so sports can transform youth. Learn how you can become a positive coach. If you are interested in using a phone call system to communicate with parents you can create an account at Dial My Calls to send 25 free calls per week. This site can be used to send messages to parents about practice cancellations or game cancellations. Click the link to set up your account for free.